Sigo con mi obsesión por hacer proyectos que impliquen contar historias principalmente con palabras (hago esa aclaración porque sé que hay muchas otras formas de contarlas). 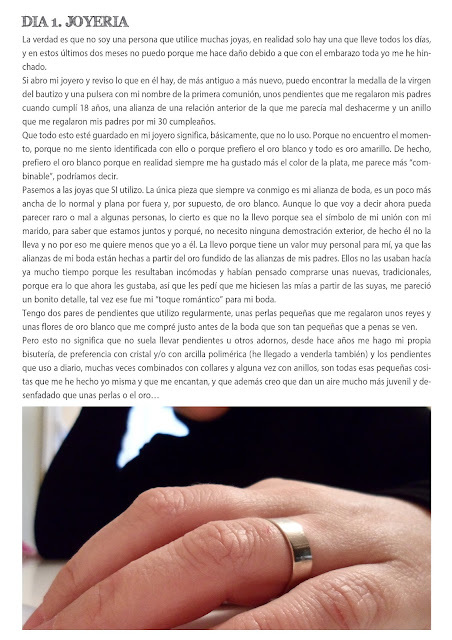 Hoy presento mi primer texto para 31 things, de Ali Edwards. Este curso de Big Pictures Classes consiste en documentar los detalles de tu vida cotidiana a través de un texto y una foto. I continue here with my new obsession: to do projects that imply writing as a way of telling a story. Today I present you my first text for 31 things, by Ali Edwards. This Big Picture Classes workshop consists in document the details of real, everyday life through words and one photo. Así como Simply A Moment lo escribo en inglés, 31 things voy a escribirlo en castellano, porque me apetece más, simplemente. Voy a intentar hacer uno cada semana e irlos posteando regularmente. Ya os dejo con el primero, ¡hasta otra! I'm writing Simply a Moment in English, and I have decided to do 31 things in Spanish, just becase I prefer it. I'm going to try to write one prompt each week and to post them regularly.Here you have the first, see you! Me siento muy identificada con tu foto, y sobre todo con tu texto! Viva el oro blanco y la bisutería "handmade"!ja,ja,ja. Your photo is beautifully simple but very meaningful. I agree with you about white gold and silver - I have never been very keen on yellow gold either. Looking forward to your weekly things during the rest of the year! I'll try to finish this project, I really love it!